What do the psychologists have to say about the way the decision-makers have acted? What have the behavioral economists learned from this? I am interested in hearing from the earth and atmospheric scientists, the aeronautical engineers, the physicists. What can science bring to the table? On Wednesday April 14th, on the way to London from JFK, the pilot announced a slight delay into Heathrow in order to avoid the ash cloud coming out of the Icelandic volcano eruption. This was the first time I paid any attention to the subject. That flight must have been one of the last to arrive in Heathrow before airspace was closed. That evening, British television was all over the first debate between the candidates in the national election. But I was glued to the news from Iceland. I had gone to London for the London International Book Fair, which was eerily deserted as nearly everyone except the British and French (who took the train) were unable to get there. The talk in London was about who was stranded in London, and out of London, and the heroics of certain individuals who had braved 20-odd hour trips cars, trains, and ferries to get to London from places like Munich, Rome, Umbria. Tuesday night April 20th in London, I went to bed at midnight, having a confirmed reservation for a 10:30am return flight, but no idea if the airspace would open up in the morning. It did at 10am, and I was very fortunate to be on one of the first planes out Heathrow (only about 2/3 full) arriving at an empty JFK, which, until Wednesday had been a temporary home to hundreds of stranded travelers who slept on tiny cots, and took showers in two specially outfitted trucks outside. Even as of this writing, if you don't have a confirmed ticket to New York, the first available booking is in two weeks. It is very chaotic and it's not over. Something is going on here that requires serious thinking. We've had earthquakes before, and we've had plane stoppages, but nothing like the continuing effects of the ash cloud. I am reminded of the warning call by Freeman Dyson is his Edge feature "Heretical Thoughts About Science And Society" about the use of modeling with respect to global warming. What the ash cloud models apparently showed had little to do with reality, as there were few, if any, actual measurements. What do the psychologists have to say about the way the decision-makers have acted? What have the behavioral economists learned from this? I am interested in hearing from the earth and atmospheric scientists, the aeronautical engineers, the physicists. What can science bring to the table? Caught up in Moscow because of the volcanic ash cloud last week, my biggest regret was missing the annual Edge dinner in London on 19 April. Well, just look at the sort of people that Edge Foundation president, literary agent and superconnector John Brockman manages to bring together. Guests at last year's London dinner ranged from Alfonso Cuarón and Terry Gilliam to Brian Eno and Richard Dawkins. So you can see why it was painful for me to be 3,000km away while all the big ideas were being nurtured over the entrees at Zilli Fish. But Brockman -- whose latest book This Will Change Everything (Harper Perennial) lies well thumbed on my desk -- is not a man to waste an intellectual opportunity. In town from New York for the "eerily deserted" London International Book Fair, Brockman became caught up in talk of stranded travelers and 20-hour road trips. "Something is going on here that requires serious thinking," he reflected. "We've had earthquakes before, and we've had plane stoppages, but nothing like the continuing effects of the ash cloud. Why?" So he invited the Edge community of smart and original thinkers -- from behavioural economists to psychologists, physicists to software engineers -- to think about the ash cloud and the reaction to it, and tell him (in 250 words) something "that I don't already know and that I'm not going to read in the newspapers". The ash crisis and the financial crisis have much in common. Both result from the fact that almost all decision makers do not understand mathematics and science, even in a rudimentary level, while most mathematicians and scientists have no feel for the real life implications of their calculations. Both camps refuse to admit their failings. "Financial engineers" created complex mathematical instruments, neglecting to emphasize unavoidable assumptions they had to make. At the same time, senior bankers and regulators did not admit that they had no idea what these papers really meant, and never asked whether there were undisclosed hidden assumptions, lurking behind new quick ways of profiteering. Theoretical scientific model builders convinced authorities that the ash cloud is here or there, without bothering to measure anything, while no one asked whether the computer model was based on realistic assumptions. In both cases, decision makers, with good training in standard scientific thinking, could smell trouble immediately, even if they knew nothing about derivatives or volcanoes. The fingerprints of a sophisticated pyramid scheme should be obvious whenever one claims he can always win, and a "killer cloud" that no one can see, affecting an entire continent, based on no actual measurements, should have raised any intelligent pair of eye brows. The world is discovering that an important profession is missing: Scientifically trained political decision makers. Neither a good scientist lacking management experience, nor a smart politician with no scientific training, could spot the trouble. We need people who have both qualities. Human beings are case based reasoners. What this means is that we see new things in terms of old things. Our prior experiences guide our actions in every situation. However as this kind of reasoning often feels like "seat of the pants reasoning from the gut" it doesn't look or seem very scientific. Moreover, there is not much work on how people actually do case based reasoning (outside of AI) since it is very difficult for psychologists to run experiments on this kind of reasoning since they can't control for the experiences each subject may have had beforehand. So, we see books on decision making which propose reasoning by weighing costs and benefits or following a set of rules which try to make reasoning a process that is more precise than it really is. Statistics are nice, but prior relevant experience is better. We are collectively confused by the ash cloud because we lack prior experience. We are left to reading what Ben Franklin wrote about the summer in Europe in 1783, which is, of course a prior case, but not one we have much knowledge about. People worry when they need to make decisions without relevant cases to draw upon. We are confused, as we should be. Computer Scientist, International Software; Former Chief Architect, and Distinguished Engineer, Microsoft Corporation. I was in Budapest with my plane (a Falcon 7x which is the most modern business jet, the equivalent to top airline technology) when the cloud came. I've heard of the closure on the radio 2 hour before it was to occur, I alerted the pilots, and we rushed to the airport, taking off for Palma in the South with 15 minutes to spare otherwise we would have been stuck. I am still in Palma, where I can comfortably work, but I am closely monitoring the situation since soon I need to rejoin my wife in Sweden and return home in Seattle. There is no question that ash, when present, is a danger to aircraft. To actually crash an airplane you would need lots of it — the known scary encounters (no lives were lost however) occurred at night, before this danger was recognized. However, tiny amounts can also damage the engines, not that they would stop working, but their maintenance costs would go up greatly. There seems to be a rational willingness on the parts of scheduled airlines to accept a fair bit of economic risk and fly, instead of a much greater economic risk of not flying. My engines are on warranty which is worth a lot of money. We are told considerably more stringent limits of where we can fly without losing the warranty, even though we could legally and presumably safely fly outside of the designated areas — we just have to be an extra 100 miles or so further and 10000 ft higher to keep the warranty. I was shown a NASA report where a research aircraft flew a few years ago pretty far from an Icelandic volcano yet it suffered engine hot section damage that required expensive repairs. The skin of the plane was not affected at all and there was not indication during the flight that the damage occurred. Having said this, it is rather mysterious where the daily detailed maps of the cloud limits come from — how many direct measurements are taken, how many interpolations and extrapolations are made. It is not communicated well at all. I can foresee that detecting volcanic dust in the air will one day be a part of aircraft instrumentation (in my early days with computers, "large" car-size disk drives of tens of megabits in capacity had a "sniffer" attached to them that looked for dust that preceded a disk crash so that the heads could be withdrawn). Once we have direct measurements the maps (and models) will be much more reliable, and they would be used for planning only, not as hard fly/no fly areas. For example we do not close down airspaces for thunderstorms even though they are extremely dangerous, because planes have weather radars and other instruments (lightning detectors, wind shear detectors) to detect the proximity of the danger and avoid it. First, the consequences of the eruption are a true Black Swan. As far as I know, and I track these things, this particular scenario has never been published. By the scenario I mean a large scale and perhaps sustained disruption of aviation (and perhaps more) because of volcanic ash. Second, the event may not be over. If the volcano winds down and nothing more happens then this will have been a brief and not terribly costly lesson in the density of interconnection and disruption. However, if the volcano starts up again, or erupts sporadically over the next few weeks or even worse the bigger volcano next door goes off and adds substantially to the ash cloud the consequences could be vastly greater. The first order effect will be to disrupt aviation again. But this time if the eruption persists then the cloud will spread much further eastward and southward eventually reaching China and the US, disrupting air travel throughout much of the Northern Hemisphere. The second order effect will occur as the dust settles on the surface impacting agriculture in some places, open water sources and acidifying upper layers of the ocean. Finally the third order effect would be on the weather with likely dramatic short term cooling being the result. The combination could trigger another major economic downturn. LESSONS FROM AN ICELANDIC ASH CLOUD: WATCH OUT WHAT YOU ARE SPEWING! As a climatologist and lecturer, it is not surprising to get all kinds of questions from your audiences about the elements. Recently, though I was formally talking about how to value environmental goods and services in economic models, the audience pushed me on the big news weather story of the day — the Icelandic volcano. One said: "Nature still bats last and we should be humbled by her power and not provoke her with pollution, for she can be a dangerous adversary". But another kid had a totally different line, more like what you hear daily from the coal industry — "see, we can't really be a big force in the environment because nature is so much more powerful; we are puny and the media and environmentalists just exaggerate our impacts." So who is right in this dichotomous set of metaphors? Actually, speaking like a typical academic, they are both right — or to be more correct, partially right. Indeed, it is well established that for non-linear systems when they are forced to change rapidly that they are prone to potentially risky, disproportionate responses. Furthermore, as this eruptive event reminds us, we are still quite vulnerable to Nature on a tear, whether of her sole doing or provoked by us using the atmosphere as a free sewer to dump our wastes. But the more conservative kid had a good point too — nature can be much more powerful than us. But what he forgot is the scale issue. For a while, yes, we are puny Nature is powerful. But our emissions of pollutants that are long lived — like CO2 — are continuous and cumulative, whereas most powerful natural events like hurricanes and volcanoes are one shots. Furthermore, many deniers of the seriousness of human impacts on climate use the argument that volcanoes put more CO2 into the air that humans — totally false by the way on an annual basis averaged over decades. So let's take this recent volcanic story as a good case in point. In its first week of spewing, the volcano was estimated to emit daily about 10,000 tons of CO2. That's a thousand times more than the average US citizen causes to be dumped in the air each year. But we do it year after year and we are over 300,000,000 strong — so we, not Nature dominate in that scenario. Moreover, because of the grounding of 60% or so of the Euro air fleet for many days, which daily emits something like 350,000 tons of CO2, the volcano actually reduced global warming emissions a tiny bit by forcing some 200,000 tons of CO2 a day to stay in fuel tanks on the ground and not get injected into the atmosphere. Of course neither that tiny amount of CO2 relative to human annual injections, nor the relatively tiny amount of ash associated with the eruptions so far, will have more than a barely detectable influence on climate. The real lesson here is to check out the credibility of your clichés before your utter them. And double check your numbers before issuing ostensibly generalizable assertions. Emotionally tangible metaphors make a good storyline; the media love them. But very often they prove to be a poor way to inform a literate and numerate society so desperately in need of credible assessments of scientific problems. I was pleased and fascinated by the Ash Cloud because it reaffirmed the randomness of the lexicon of "big news". By this, I mean it was an example of the way in which insignificant words or phrases can suddenly be transformed into synecdoches. An apartment building and hotel in Washington D.C. — Watergate; a girl's name — Katrina; a date — 9/11; an insignificant Ohio resident — Joe the Plumber; a town in Texas — Waco; even a made-up boy's name — Harry Potter; and now the Iceland ash cloud: each of these suddenly and unpredictably acquires a familiarity and a significance which endures. Unlike, say, a scientific discovery or a political event, none of the events connected with these synecdochic terms could have been foreseen. Virtually by definition, no one could have said in April, 1972, "I could imagine a situation in which a break-in at the Watergate apartment complex could lead to the downfall of a U.S. President." No one could have imagined that a date in September 2001 could become burned into global consciousness in the way it has. Even an event like Hurricane Katrina could not have been anticipated to lead to the complex mess of hundreds of deaths, billions of dollars of property damage and political incompetence which gave its name a whole new level of significance. Why is this fascinating? Because lurking in the world of today are the synecdoches of tomorrow. And no one — literally no one — knows what they are. Old technology — propellor-driven planes — would not have been grounded by ash. I may be proven wrong by the reactions from the atmospheric scientists, physicists and aeronautical engineers but this debacle seems to have had far less to do with science than to a far more pernicious and growing risk aversion in British society and perhaps the world. The science is almost without a doubt far far better than it has ever been, and there was data collection. The shutdown of our airspace was driven by people worried they would be hounded out of their jobs (politicians, airline bosses, etc.) and shamed. It is far easier to hide behind the shield of "I was only trying to save lives" than to get it wrong and kill someone. I have been puzzled for some years now by what is one of the most unstoppable and yet not always obviously good ideas to be surging through our minds for the last century: that of democracy with a small d and all it implies for self-interest, so-called 'rights', protection, etc. That is another topic, but the current hysteria appears to be part of its wider manifestations. The world, shrunken by smart phones, red-eyes and the Web, is once again immense. The earth has, however briefly, trumped technology. As a gigantic plume of ash has blanketed Europe, we are reminded that for millennia our ancestors were born, lived and died in the same villages, most smaller than Central Park. The fact that you could get word in New York today that your presence was required, or perhaps merely desired, in New south Wales tomorrow, and make it so, that your biggest concerns would be "JFK or Newark? ", "The chicken or the fish?" leant you a illusory power, the belief that the earth had been conquered. The ash cloud proves otherwise. The earthquake that devastated Haiti was horrifying, but for most Westerners it was just a reminder that the earth can kill, not imprison. If anything, the aftermath in Haiti moved people, literally. A single landing strip was the sole rate-limiting factor for those arriving from around the world. Those marooned in Europe this month can still drive from Paris to Prague, yet feel the walls closing in. Most of the world's people continue to be born, live and die in the same villages, and the rest of us pay dearly for the privilege of a week on an a secluded isle, sworn off HBO, and the Internet, off our Kindles and iPads, pretending the world is as it once was. At least until the helicopter lands on Sunday afternoon. By returning Europe back to the world of small places, a volcanic eruption has given us back a big world. In 1940, we had the opposite problem: how to keep German aircraft from flying over London — and how to keep British aircraft from flying over Germany. The ash cloud arrived 70 years late! Norbert Wiener and Julian Bigelow are remembered for having designed an anti-aircraft fire control system that, while never built, gave the discipline of cybernetics its start. Their "debomber" generated a statistical prediction of where a given enemy aircraft was most likely to be at some future time. The gunner had to set a timed fuse and guess where the airplane would be at the designated instant, while the pilot only had to guess where the shell would be at that instant, and be somewhere else. In 1940 only one out of about 2500 anti-aircraft shells scored a hit. Wiener's forgotten earlier suggestion, submitted to Vannevar Bush in September of 1940, was to circumvent the need for precise intelligence by "bursting in the air containers of liquified ethylene or propane or acetylene gases so that an appreciable region will be filled with an explosive mixture [and] interdicted to enemy aircraft." The explosive regions would have been invisible, yet deadly, like low concentrations of volcanic ash. This unsportsmanlike proposal got no response from Vannevar Bush. Had Wiener's proposal been adopted, there would have been a brief victory while enemy aircraft were grounded in response to reports of bombers mysteriously falling in flames from the sky. Then the statisticians would have got to work, and determined that the threat, though invisible, was no worse than the visible threats that pilots had long come to accept. We let ourselves be grounded, briefly, by an invisible threat coupled with the lack of a definition of acceptable risk. If we have drone aircraft, with fine-tuned senses, that can stay in the air for 24 hours at a time over Afghanistan, we can surely prepare to have real-time sampling concerning the next ash cloud. That would make the risk both more visible, and more politically acceptable, I think. The first Icelandic ash cloud of 2010, and the response to it, marked a signal transitional moment in the history of modern human culture. Faced with an unprecedented trans-national environmental crisis and without an obvious humanitarian 'rescue and rebuild' narrative; we just shut down the world. The response clearly demonstrated four specific weaknesses in our highly leveraged economic systems and our political processes. 1. Globalized 'just in time' manufacturing and delivery systems are highly vulnerable to trans-national environmental crises. 2. National Governments cannot respond coherently to trans-national crises. 3. Trans-national industry groups will seek to limit restrictions in favor of profits during a crisis. 4. Environmental crises, ranging from disease to climate disruption, are being treated on a case-by-case basis, even if the actual possible strategies are always limited to a narrow range of options (fly/don't fly). We need to do better. The next half-century will see increasing amounts of total environmental stress, with fewer total social resources to deal with them. More and similar crises will be happening in real time, without a plan or a precedent. Solutions will be continuously improvised from a small range of existing options leading to chaos, vast financial losses and ultimately the public loss of faith in the ability of our economic and political system to adapt positively to rapid change. There are enormous economic, legal, ethical and philosophical incentives for creating an international systemic response for all types of trans-national environmental crises but particularly those that do not involve immediate danger to large groups of people and do not draw media attention. This is the lesson of Iceland. Because attention is a scarce commodity, we miss gradual trends until some dramatic event pushes them to center stage. One important trend that this eruption highlights is the rapidly growing fraction of international trade that travels by air rather than by sea. Some estimates put this fraction at 40% of goods by value (in contrast to just 2% by weight.) This trend brings many benefits but does induce new potential disruptions to global supply chains. Dramatic, low probability events can also lead us to infer a trend that isn't there. For a parameter like the fraction of goods traveling by air, it makes sense to average data over this year and a previous year and conclude from a change that there is a trend. For a parameter like the frequency of volcanic eruptions, we should compare averages over much longer horizons. Yet when something like an eruption takes place, people start implicitly look at short intervals and spuriously conclude that the parameter is changing. "Look, compared to last year, the rate of eruptions is way up." This seems to justify the initial decision to look only at the recent data and thereby confirms the trend. As Ken Rogoff and Carmen Reinhart have pointed out in the context of financial cycles, a good tip off about this kind of faulty inference are claims that "this time is different." In the present context, comparable claims would be that "this changes everything" or "the sky is falling/changing." Uncontrollable forces of nature outside ourselves, are similar to those inside of us: Geological phenomena are similar to strong emotions, feelings and psycho-pathologies. We cannot control volcanic eruptions, and most of the time, we cannot control strong anger or strong fear. "Nature is more powerful than us", comes to mind when we see a huge cloud collapsing our technological wonders: Airplanes and global transportation. With this idea the dichotomy between us and nature becomes deeper, and we easily forget that nature is a continuum that transcends humanity: From star dusts to genes and neurons. Two ideas should be kept in mind when dealing with this epistemological and methodological entity called "nature". First, we do not have the "real" image of nature, and maybe never will. We only have models, theories and simulations, in which "facts" are defined by a partial number of variables. Second, we need more integrative thinking: Scientists working together will recognize the complexity of nature, have a more accurate image of it, and will stop proposing naïve models. This applies to understanding volcanoes, brains, markets and stars. We cannot surrender to the complexity. When we stop trying to explain nature through science, we try it through religion or myth. Curiosity is also a force of nature, and science is the best tool available to understand the world — and maybe, just maybe, even control it without damaging it. That's the best we can do with uncontrollable forces of nature: From volcanic ashes to emotions. Most natural disasters cannot seriously disrupt civilization on a continental much less global scale. Storms, floods, and earthquakes can take out a city or two and kill a few hundred thousand, but only in the absence of sound construction codes, seawalls and so forth. Tsunamis can swamp entire ocean rims, but only thin coastal zones suffer, casualties don't exceed six figures, and warning systems can reduce losses except for those too close to the waves' origins. Two items can really hurt civilization, but only one is unstoppable. An extraterrestrial impact approaching or matching those that probably cause mass extinctions is potentially preventable by using the gravity of a large space probe to nudge the orbit of an asteroid or comet. The Eyjafjalljokull eruption merely hints at how vulnerable humanity is to the planetary radiation powered heat engine that cannot be tamed — the little event was seriously annoying only because we replaced robust rail and ship travel with delicate airliners. It's the super volcanoes that put out enough ash to cover most of a continent and cause an extended global winter that will someday wreck much or all of human civilization if the latter is around at the time. The Yellowstone Caldera, for example, devastates much of North America every few hundred thousand years and is due for another blow. The ultimate solution is for humanity to do what it should anyway, shift minds to off-planet virtual and robotic cybersystems that don't care what trivial activities occur back on earth. The ash cloud demonstrates that when it comes to major explosions in our interconnected world, there is no such thing as 'local' or 'regional'. A recent set of scientific studies by Alan Robock of Rutgers University and Owen Toon of the University of Colorado at Boulder and their colleagues, and reported upon in Science demonstrates a more pernicious impact of even a limited nuclear exchange, in what, for North Americans, would seem to be a remote corner of the world. The studies conclude that a "regional" nuclear conflict between India and Pakistan, in which merely 100 Hiroshima-size weapons were exploded in these nations would significantly disrupt the global climate for at least a decade. Up to 5 million tons of smoke would rise above cloud level and within days form a global stratospheric smoke layer, which would block 7-10% of sunlight reaching the earth for years. Compare this to the current situation in Iceland. Recent estimates suggest that the Eyjafjallajökull eruption has spewed perhaps a million tons of particulate matter into the atmosphere thus far, slightly smaller in magnitude than the amount predicted to result from such a limited nuclear weapons exchange. But the particles of soot from the intense fires arising from nuclear explosions are much smaller, and therefore rise higher into the atmosphere. At the same time they reflect more light than the larger silicon particles emitted by Volcanoes. The net result is that this soot would remain in the atmosphere far longer, and have a far greater climate changing effect, affecting agriculture world-wide. The lesson we should draw from this is simple. If a simple volcano in Iceland can immobilize much of the world even a small scale nuclear conflict has the capacity to affect all of humanity so profoundly that mere airline flight cancellations would be the least of our worries. Eyjafjallajokull is not the first volcanic eruption to inspire serious thinkers to ponder the role natural disasters play in human progress. In his Discourse on Inequality, Rousseau explained that man's fall from a state of nature into a state of society was caused by events such as the eruption of "lightning, a volcano, or some lucky chance." In Rousseau's epoch, there is evidence to believe that people worried, as we do today, about disruptions in climate and the increased incidence of natural disasters. Europe witnessed unprecedented erratic weather patters during the summer of 1783 with heavy fogs, an earthquake and a volcanic eruption, and the winter of 1783-4 saw freezing temperatures for 69 days, according to the Journal de Physique. "[T]he entire globe seems to be preparing itself, by a pronounced upheaval in the course of the seasons, for physical changes," the radical revolutionary Jean Louis Carra wrote. The natural disaster symbolized an upheaval. For Rousseau it continuously propelled man along a singular path that brought him out of nature forever. But for others, like Carra, it was a cyclical event. The making, unmaking and remaking of civilization. Volcanoes are age-old revolutionary devices. Carra argued in his Système de la raison that the path of human history had not been one of linear progress, but rather cyclical: "If the gradation of ideas, of reflections, of comparisons and of systems only follow from their origin a straight line, that which leads from simple nature towards higher reason, the human species, without doubt, would not have had so far to go and so many detours to make, in order to reach its goals." Similarly, Nicolas Bergasse likened the progression of reason and human understanding to a violent volcanic eruption, or a tempest in the night. He wrote: "The field of science resembles the soil of Sicily, that owes its richness and fertility to the agitations of the volcano that burns in its breast. But if men believe to have a way to stop genius from progressing, by whatever means, excused by the instinct of self-preservation, why would men fear its usage?" Unlike Rousseau, he went on to ask his readers why one would simply stand by and watch one's cottage consumed by lava, if one believed that one might be able to stop the progress — not just of the eruption, but of what it represented for human society — the progress of human intellect. Bergasse believed the clocks could be turned back, and this could be accomplished by mastery of the physical world. Over two centuries later, a volcanic eruption in Iceland has put technology, the ultimate manifestation of "human progress" and our independence from nature, at bay by grounding thousands of airplanes around the world. Is part of the allure of the volcanic ash that it presents an opportunity to reinvent ourselves? Or to others, the prospect of perfecting ourselves? What is at stake? The ash cloud is just a little reminder that the earth is powerful. Volcanic eruptions are something we have to live with in order to enjoy the benefits of the nuclear power that keeps the earth's core hot. Without this we would probably not have life. Certainly life seemed doomed about 700 million years ago when, for reasons that are not fully understood, the earth entered a snowball phase, in which its entire surface was covered with ice, 25 feet thick even at the equator. Ice reflects light really well, and, all else being equal, the earth would have remained stuck in this cold state forever. But volcanic activity continued, and without green plants to remove the carbon dioxide, the level of CO2 built up until it was measured in percent rather than parts per million. The greenhouse effect warmed the earth: The volcanos saved us. What everyone is failing to do is to applaud the job well done in coping with the ash cloud. Aviation experts correctly realized it was a threat, satellites tracked its course and scientists were able to predict its movement in real time. Most importantly, no one died. Getting stuck for a few days in England might be slightly inconvenient, but it sure beats having your plane fall out of the sky. The ash cloud was only a minor perturbation of the earth's systems. Let's hope we don't have to deal soon with anything serious, like the meteor that drove the dinosaurs extinct. Ironically I was on Mt Etna collecting volcanic ash when the aviation chaos ensued so I enjoyed a three day return to the UK from Sicily instead of a 3 hour flight. However what occurred in Iceland is not entirely surprising in a geological timescale. Icelandic volcanic ash layers from explosive eruptions occurring over 10,000s years are known to exist across western Europe and the North Atlantic, from Scottish lochs to Swiss lakes, to the Greenland ice cores and to North America. Ash dispersal can be mapped according to where it is found and the distribution patterns are in many ways similar to what was observed/modeled for Eyjafjallajökull Iceland last week. Interestingly the work of a NERC RESET Consortium has shown some areas like Spain appear to be devoid of volcanic ash (over long time periods) and so the plan in April 2010 to use Spain as a hub to repatriate European travelers stranded overseas may have been sensible. Of course it is size as well as distribution of ash that is important and the ash particle size decreases significantly along the plume axis so particles arriving in the UK (1000km from Iceland) last week were <100 microns whereas larger and denser particles would have been sedimented out much closer to Iceland. So guidance to aviation is very different dependent on how close you are to the erupting volcano, the further away the smaller the particle size so less of a hazard. Near or proximal to the volcano there is a serious hazard. 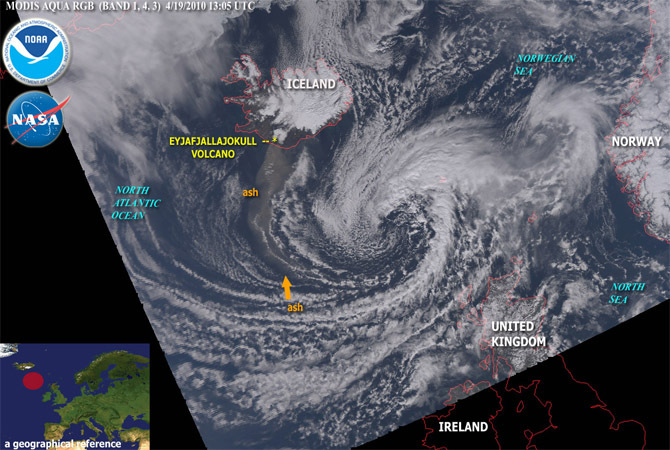 Aviation chaos resulted in April 2010 but in 1783-84 a major eruption from Laki Iceland, lasting months, led to a dry sulfurous fog across Europe that triggered crisis mortality rates and crop failures in western Europe. We wait to see if (as has been the case in the past) the eruption of Eyjafjallajökull indicates a reawakening of Katla, one of the most explosive volcanoes in Iceland, known to have dispersed volcanic ash across Europe, Asia and North America. Governments are tending to become less rational, and this has real costs. The ash cloud is yet another example. Airlines and regulators have been playing liability games for years over volcanic ash; they couldn't agree a safe level until reality intruded and forced them to. What can scientists do? Help spread this simple message: countries that educate their citizens to be more rational about risk will become more competitive. It's not just ash! From mobile phone masts to GM crops, and from nuclear power to terrorism, the public keep getting bamboozled. The reasons are well enough understood; this club includes many of the scientists whose work in economics and psychology exposed and dissected the mechanisms. Over the past quarter century, we've gotten our schools to teach computing. That was sensible enough: now the world is based on the computer, the citizen should know how a computer works. But our world is also driven by persuasion, propaganda and deceit. So maybe behavioural economics should be added to the syllabus. Our kids and grandkids need a better understanding of how they can be manipulated. This episode presents an interesting case study in thinking about how societies want to deal with risk. There has been considerable grousing about the decision to shut down the airlines, and this grousing is understandable from those who were stranded away from home or were making a living in the airline business. But here is a question to ponder: What system would be better? A libertarian might suggest that airlines (and owners of private jets) should decide for themselves whether to continue flying. I am not sure whether the airlines would really welcome this freedom to choose. Suppose that the cloud "merely" risks damaging expensive engines as opposed to inducing crashes. How much of this risk should the airlines bear? And, are they entitled to raise prices if they choose to fly? (Imagine the uproar if airlines offered to take off at five times the usual price!) What if there is also a small increased risk of a crash. How small does that risk need to be for it to be considered acceptable? Personally, I have no basis for deciding whether the decisions about when to close and open airspace were made correctly. But now that we have seen that this can happen, it is clearly important that scientists (including social scientist) weigh in on how such decisions should be made. I once shadowed a geologist in search of volcanic ashes. We were more likely to see the mane of a lion than the mane of an Icelandic horse, but Africa's Great Rift Valley has much in common with the geological forces that inspired Eyjafjallajokull. Both are rifts where continents are pulling apart from each other. Iceland was born about 20 million years ago when North American and Eurasian plates stretched the Mid-Atlantic Ridge to such as extent that hot molten rock rose to form the island. In Africa, you have nothing less than Kilimanjaro as a reminder, plus the Ngong Hills "like immovable darker blue waves against the sky." Karen Blixen was correct to describe a piece of earth as fluid as the surf. North American and Eurasian plates move two centimeters apart per year, and the separation of Africa and Arabian plates is so obvious that early astronauts saw Africa's Great Rift Valley as one of the most visible features from space. This huge ragged scar in the face of the earth stretches across 7 countries, from Turkey to Mozambique. It began — perhaps 14 million years ago — as the earth's crust began to pull apart from east to west. The greatest activity occurred in Ethiopia's Afar Triangle, where the fossil skeleton Lucy was found. Before the Rift in East Africa began, much of the area was covered in rain forests, like those in the Congo, Uganda, and Rwanda. These countries are home to cousin chimpanzees that do not thrive on the eastern, more arid side. Some scientists see the Rift as a zone of divergence in human evolution, suggesting we descended out of the trees, as it were, because trees became sparse. Whatever inspired that evolutionary transition, our ancestors clearly relied on freshwater lakes that formed in the Rift floor. Olduvai Gorge was once a lake, but it was fossil deposits around Lake Turkana that drew geologist Frank Brown to unravel what he called "thin slices of time." When I joined him on a survey nearly 25 years ago — a mere wink in geological time — Brown used ashes from 125 volcanic eruptions to date fossils. The method he uses is called fingerprinting. Because each volcanic eruption produces a distinctive chemistry, each tuft has a signature. The eruption date is calculated by the potassium argon method. Bones above the tuft are younger; bones below, older. About 3.6 million years ago, Sadiman erupted in Africa's Rift, not far from Olduvai. As the ashes settled, a gentle rain followed, laminating fresh footprints made by early ancestors. Their evocative path is now hidden from view, but not from the minds of people who don't always need an airport to travel far. Perhaps it is the unsustainable ways of a certain upright ape species that is the real calamity. Steven Wright pondered that he couldn't see electricity, that's why he didn't pay for it. It was a crowd pleasing joke underlining the human condition wherein we deny features of the world that cannot be regarded first hand, an innate predilection that discounts invisible components, even ones that affect us daily. Most likely it is a mental filter developed as a necessity of evolution allowing us to extrapolate fact from the chaotic chimera of daily thought, and by doing so lets us accomplish a day's work. Now the Icelandic jabberwocky Eyjafjallajokull, north of Skógar and west of Mýrdalsjökull, has belched nature's dye-marker into the atmosphere making us aware that, well, there is an atmosphere. I mean of course we know there is one supposedly, something holds up aircraft, but similar to Mr. Wright oblivious to electric current of all frequencies coursing through his home, there was some lingering doubt about this atmospheric global warming guff, because, well, one can't see it except by proxy, and who can remember their substitute teacher? Eyjafjallajokull has been shooting tephra into the air since the Napoleonic Wars, but in 2010 it airmailed a modern dose: 110,000,000 cubic meters of debris towering nine kilometers and covering 10 times zones immobilizing a populous continent. The massiveness of this experience and the havoc it created has pushed atmospheric science forward in our mind, into first hand experience, the only place where we act. I'm not a scientist, I'm a philosopher, a social epistemologist, and I am definitely a European. While reading some of the scientific answers to thus provocative Edge question, I was wondering whether I could add some evidence not coming from the science of ices and fires, but from the more modest reality of European policy making. You may be not aware of the inclusion in the Maastricht's Treaty on European Union of the Precautionary Principle for potential ecological and health disasters: (Article III-233): "Union policy on the environment shall aim at a high level of protection taking into account the diversity of situations in the various regions of the Union. It shall be based on the precautionary principle and on the principles that preventive action should be taken". Roughly speaking, if you don't know anything about the situation, be as prudent as you wish. This principle, that stems from the ecological Earth Summit in Rio in 1992, according to which: "In order to protect the environment, the precautionary approach shall be widely applied by States according to their capabilities. Where there are threats of serious or irreversible damage, lack of full scientific certainty shall not be used as a reason for postponing cost-effective measures to prevent environmental degradation" has been integrated not only in the ineffective Maastricht treaty, but also in many European laws. This riddle of decision making is made even more complex by the multilevel decision making in the European Union: After 5 days of uncertainty, ministers of transportation of European states, without any established decision making procedure, set up a conference call in which they decided against the IATA advice and following the Eurocontrol's recommendations to close the European airspace. Note that this would have been impossible in the United States, where the precautionary principle is invoked only for military security reasons and where the Airline companies have the last word in safety matters. When asked for justification of an apparent lack of proportionality between the potential threat of the ash cloud and the closing of the airspace, most European ministers didn't find anything better than to appeal to the wisdom of proverbs: "We are never prudent enough in airspace security". Well, "good-enough" wisdom is obviously not good-enough policy if it can ground a whole continent to earth just with a proverb. We do not need better science in this case. What we need is better social science of how decisions are taken, how we can set up transparent and robust procedures and take evidence into account even in cases in which such evidence is underdetermined. When I was young and idealistic, I heard social scientists talk about the duty of expert decisions to face the opinion of the society at large. Today we are confronted with an epistemocracy of the uncertain that makes people swallow the worst decisions under the authority of a so-called expertise. Definitely not good enough. What does art history have to tell us about the cloud of volcanic ash that obscured the sky bringing European air space to a weeklong standstill? In the history of Western painting the cloud is a recurrent element that as the visionary French philosopher Hubert Damisch contends is the most fleeting of all masterpieces: they can be found everywhere from Giotto to Constable and onwards to Modernism. Damisch wrote in his 1972 book, A Theory of /Cloud/ that the cloud is found exactly at the point in the system where it escapes. It vanishes within the graphic system only to discover itself again. Cloud archaeology is a science for angels. If the cloud is the zero degree of painting geometry defaults where it meets the sky: The system of linear perspective cannot take into account the full complexity of visual experience and hence generates the cloud as a sign, as an agent, as a counter force with which it is in dialectical interaction. The cloud introduces something that has no place in painting but at the same time is painting. Damisch concludes that painting is itself defined within this paradox. Perhaps we have learned that air travel is defined within another paradox; the control of the uncontrollable. The cloud introduced something that has no place in air travel but at the same time is air travel. Imagine a public official who considers an action that involves a small and ambiguous risk of disaster. Imagine further that the best expert judgment available is that the expected social benefit of the action is large and that the risks are real but tolerably small. Such situations inevitably create a conflict between the interests of society and those of the officials who are charged to decide on its behalf. Hindsight and personal accountability are the problem. Decision makers can be certain that if the worst happens their decision to act — however justified it was ex ante — will be perceived ex post as a horrendous mistake. They face the possibility of devastating blame and guilt, as well as career-destroying consequences. The risks are asymmetric because the costs of playing it safe are likely to be negligible. Even if future analyses of the ash cloud incident conclude that flights could have resumed safely much sooner, it is unlikely that any of the officials involved in delaying the flights will lose their jobs. In this situation and in many others — defensive medicine is an example — the valid anticipation of hindsight combines with social norms of personal accountability to produce overly cautious behavior. Where the social good requires taking risks, we need procedures that will reduce personal accountability and diffuse responsibility, perhaps by assigning some categories of decisions to designated groups of experts rather than to individual functionaries. The ash cloud reminds us of the risks of risk aversion. Shutting down Europe's airspace removed the risk of an ash-caused crash, but it also increased all sorts of other risks: the risk of death to a patient because an urgent medical operation might have to be postponed for lack of supplies, the risk of poverty to a Kenyan farm worker because roses could not be flown to European markets, the risk of a collision between ferries on extra night-time sailings in the English Channel. And so on. Risk decisions cannot be taken in isolation. The precautionary principle makes too little allowance for the risks that are run by avoiding risks — the innovations not made, the existing suffering not alleviated. The ash cloud, by reminding us of the risks of not being able to fly planes, is a timely reminder that the risks of global warming must be weighed against the risks of high energy costs — the risks of poverty (cheap energy creates jobs), of hunger (fertiliser costs depend on energy costs), of rainforest destruction and indoor air pollution (expensive electricity makes firewood seem cheaper), of orangutan extinction in subsidised biofuel palm oil plantations. Oh, and remember the lessons of public choice theory: if you set up a body called the Volcanic Ash Advisory Centre, don't be surprised if it over-reacts the first time it gets a chance the demonstrate that it considers itself — as all public bodies always do — underfunded. Eyjafjallajokull — like 2004 Indian Ocean tsunami, the dinosaur-slaughtering Yucatan impact, the Lisbon earthquake of 1755, the Black Plague, or the election of Adolph Hitler — is simply the latest demonstration of Ming the Merciless' dictum: If you had known anything about the true nature of the universe, anything at all, you would have hidden from it in terror. Even the proudest of atheists among us often seem to unconsciously romanticize our universe as kind, stable and Providential — a universe where the benevolent balance of nature would reign if only we could refrain from using incandescent light bulbs. The hard reality is that both the Earth and the universe bristle with immeasurably powerful physical systems (not to mention biological and cultural systems) that vary jaggedly, oscillating far outside the bounds that we need for life. Any one of these could destroy us or scramble our affairs. These have been hidden from us not only by our ostrich-like inclinations, but because their time scales and physical magnitudes transcend those that evolution equipped us to perceive or appreciate. As life forms, we have become physically, biologically, culturally, economically and personally dependent on "present" conditions, on the lazy assumption that they are "normal" and will indefinitely persist. Our aviation technologies and our economic infrastructure were built over the last several decades to depend on a world without volcanic grit over northern Europe. We are even more dependent on the delay of the next eruption of the Yellowstone caldera. This, if it is like the last eruption or the one before it, will bury North America under many feet of ash, killing billions, collapsing world agriculture and perhaps industrial civilization along with it. Our problem is what statisticians call sampling error. All of our experience is far too tiny and unrepresentative a set of observations to reliably deduce the vast unknown realities we are floating in the middle of. Worse, we don't grant credence to what has not been a part of our lives. If this mental barrier can be overcome, and if the gods of randomness are kind and grant us some time, our planetary civilization might endure. We are in a hiatus between civilization-precluding catastrophes. We may have a small amount of time to discover and understand the threats we face, both known and unknown, and discover means to prevail against them. It will take a civilization far more scientifically advanced and far far wealthier than we currently are to be able to accomplish this. Our society is too much dependent on computers. Firstly, the whole volcanic ash cloud story shows us that decision makers rely too much on computer models, however good they might have been. For the first few days, nobody bothered to check whether the predictions of these models were correct or, if correct, applicable to the safety of airplanes. Nobody likes to make real decisions any more. A decision is characterized by the very fact that there is not enough evidence to make it into a logically compelling conclusion. Furthermore, our society has come to believe too much that everything can be controlled and all risks can be checked, no matter what the cost. There is no absolute safety. Another critical dependence on computer technology became evident during the volcanic ash incident. I was trapped in Oxford, trying to get back to Vienna. There was not only no possibility to reserve train seats for the Eurostar, the train underneath the Channel, or for regular TGV trains from Paris to Germany. It was not even possible to obtain via Internet or telephone any information whether the trains were completely occupied or not. All relevant Web sites simply collapsed. This was the hour of personal black market solutions to finally get a train ticket to Paris and the hour of last-minute personal decisions. It was actually fun to finally end up in a shared taxi with seven others, mostly students, driving through the night from Paris to Frankfurt in Germany, an experience I wouldn't like to miss. As I'm listening to various voices on BBC Radio 4 — petulant journalists demanding to know when we can fly again, patient scientists who reply "It's a volcano, it doesn't come with a published timetable", airline bosses in financial corners asserting the basic human right to go on holiday, stranded pink English-persons willing to take any chance to get home, their paradise island retreats mysteriously, after the allotted two weeks, having turned from haven to prison — I am illustrating a West African myth for a chapter on 'earthquakes' for a new children's book. I live right in the heart of Europe. Here, millions of people — at least those that were at home and didn't get stuck — had a very different experience: Not only a wonderful spring weekend, but also mysteriously different. Somehow more relaxing. Decelerated. A slightly deeper sleep, and more vivid dreams at night. Spontaneous childhood memories during the day. More bird song. Somehow different. It certainly wasn't absence of the noise individual aircrafts make over your head, or the bright blue sky for once being completely without condensation trails. It was more like the sudden disappearance of some subliminal stimulus, something implicit, something that you have ceased to consciously experience long ago. Have you ever experienced the unconscious background hum of the refrigerator suddenly coming to an end, because a fuse has blown? Suddenly you become more aware of the present moment, unexpectedly. But there was more to the ash cloud experience, because it also had something to do with the implicit spatial frame of reference: Freedom above — an unexpected, distinct, but subtle sense of liberation. For decades now we have gotten used to the subliminal experience of yet another layer of traffic added on top of us, a lid on the pot in which we live our daily lives, still as embodied selves, but not "on top" any more, a subtle feeling of being encased from above. A layer of non-biological noise above us has emerged, permanently closing us in. Human agency, technology, and therefore implicit danger is right over our heads. And all the time. This is a brand-new environment, one our brains never had to face in the course of evolution. It subtly shapes our spatial perception, adds a sense of boundedness, and it has an emotional component: We have lost the freedom, the openness and the infinity of the space above. What a beautiful weekend that was! And then my 6:25 flight to Berlin on Monday morning was cancelled; plus two important appointments. It made me think, and check my records: In 2009 I have created 15.19 tons of CO2, and I paid € 492,50 to compensate it. To go from Frankfurt to Sydney to give a keynote to the Australasian Society for Cognitive Science, roughly, is like driving a car for 6 years — or more than 4 times an individual person's climate compatible CO2 budget. Here is something I would really like to know: How many tons of CO2 do the more than 150 Third Culture Intellectuals annually emit into the atmosphere, just by flying alone? If one had a number for every Edge author, would one find interesting relationships from the size of their CO2 footprint to book sales, to efficiency of reputation management, or to established parameters of academic success (like impact factors and citation indices)? And who would come up with the most clever and elegant argument for why all of this doesn't really matter? The message doesn't seem to have sunk in that the eruption on Eyjafjallajokull was just a starter for the coming eruption of Katla. I've visited both these volcanoes. Eyafjallajokull sits under a modest ice cap and it is easy to hike up to a nearby pass to see it. Katla is altogether different. To appreciate its terrifying power its best to look back towards the mighty ice cap beneath which the volcano hides from the little island of Hjorleifshofoi. I say "island" for that is what it was before a succession of eruptions left it standing on huge flat sea of black volcanic ash running 12 miles back to Katla. A farmer stood on this same island when Katla erupted in 1918 and saw "whole hillocks covered in snow" flowing towards him faster than anyone could run. That eruption released 8 cubic kilometres of water and threw colossal quantities of ash into the air. Katla has erupted again and again: 1918, 1860, 1823, 1755, 1721, 1660, 1625, 1580 and on back to the first in recorded history in 894 when the entire district was destroyed. A little local museum records some incredible tales of survival. In the eruption of 1311, a farmer saved himself and a newborn child by climbing onto an iceberg that had been ripped from the glacier. A girl was buried alive in a cellar but managed to live through the winter underground. Thanks to its story-telling traditions Icelanders have long memories of their land which tell us what to expect. A massive eruption of Katla — the first in the jet age — is overdue. But already I sense, in the passing of just a few days, that the great transatlantic ash disaster is fading quickly from the news and our concerns, just as the failure of the Copenhagen climate talks is now part of a forgotten past. The world is awash with ever changing news and nothing seems to focus our minds on the long tomorrow, even when our vulnerability is so clear. Fear that modern science will fail us in ways that cannot be foreseen and predicted has rolled in with the ash cloud, but in the taxonomy of news, this was actually closer to the classic 'man stops biting dog' story. It is the concept of dependable and safe jet travel that is the black swan event here which was almost impossible to predict. Given the repeated disasters in the mid 1950s befalling the de Havilland Comet (the first passenger jet), it would have made little sense at the time to prepare for the regularity of modern travel. Further, anomalous lack of volcanic activity (particularly from Katla in Iceland since 1918 and Vesuvius in Italy since 1944) appears to constitute a second unexpected "tail event" which no scientist appears to have predicted. Ex post, however, it appears to have been put to excellent use as little treasure was diverted to researching and developing 'volcano proof' engine designs that would have given little business advantage in the long and quiet 1954-2009 expansionary period of North Atlantic jet travel. In short Eyjafjallajökull has been less the black swan than the hunter who took her. But stay tuned. To an ancient historian, the most interesting thing about the volcanic cloud from Iceland is that we know about it. Granted, I've been surprised that it now appears we didn't know as much as we we might at the height of the crisis — for I had just assumed there would be military flights testing the clouds hourly from the start, but apparently not. But there are numerous points in pre-modern history where we have some indication of events like this, events even more dramatic, with significant impact on climate and economy — but only inklings and reports and controversy and tales of miracles and divine interventions. A whole cottage industry of scholars and near-scholars worries about the year 535 AD and tries to figure out what reports from the near east to the north sea of "a year without sun" can really mean. Catastrophe is one book title; most scholars think the impact far short of that. What's remarkable is that the range of judgments is possible and can't be reduced. Even compared to the great explosion of Krakatoa little more than a century ago, this is an event of the specifically modern time when the flood of information overdoses our ability to comprehend and respond. And time hurries on: even ten years ago, it would have been orders of magnitude harder to realign travel as this evolved. Imagine rebooking all your travel disrupted that week at city ticket offices, travel agents offices, or airline counters, turning in one paper ticket to get another. We simply could not have restored normalcy in any short time at all. Go back fifty years, go back five hundred: the disruption would have been less, the ignorance greater, and the world a larger, colder, and more mysterious place.